It is a safety requirement that all children wear Chabad Double Bay camp tshirts on all excursions. There is a $10 fee for the shirt. (Shirt can be used for future Chabad Double Bay camps). Please add in the comments below what sizes you require. I am signing up my child/ren for Chabad Double Bay Summer Day Camp. I give my child/ren permission to attend all trips and receive medical care in the case of emergency, G-d forbid. 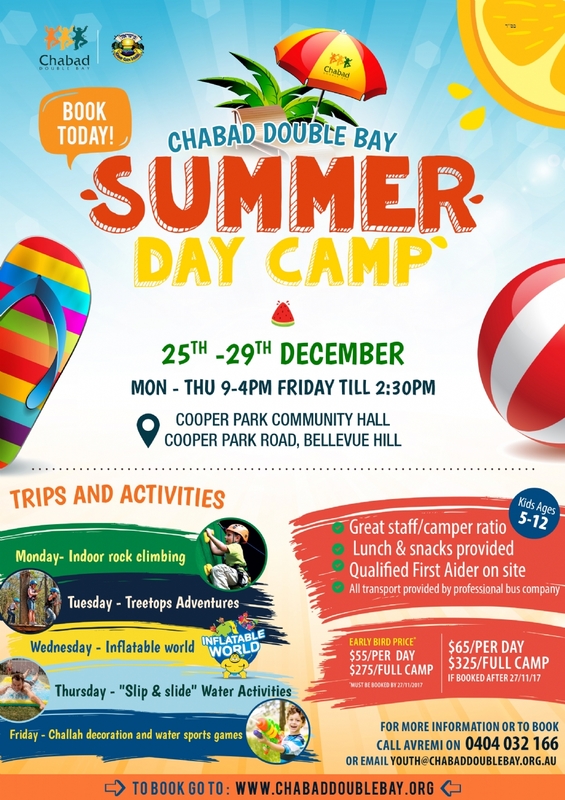 I give Chabad Double Bay Summer Day Camp permission to photograph and video my child/ren and use the photos and videos (without their names) for camp newsletters, social media and website content only.